In Word 2013, clicking the File tab opens the File menu, also known as Backstage view. Backstage view provides access to commands that have to do with the data file you’re working with — things like saving, opening, printing, mailing, and checking its properties. To leave Backstage view, click some other tab or press the Esc key. If Word isn’t already open from the preceding exercise, open it, and then press Esc to display a new blank document. The File menu opens. Categories of commands are listed at the left. 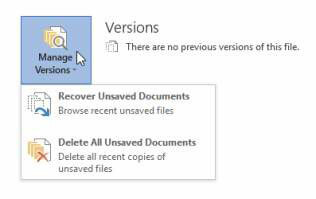 The category that appears by default depends on whether any changes have been made to the blank document that opens by default when the application starts. Click Open if that category doesn’t already appear by default. This category provides shortcuts for reopening recently used files. Click the Info category and examine the commands available. This category provides commands for permissions, sharing, and versions, as well as basic information about the file itself. Click the Manage Versions button. This button opens a menu of additional commands. Click away from the menu without choosing a command from it. 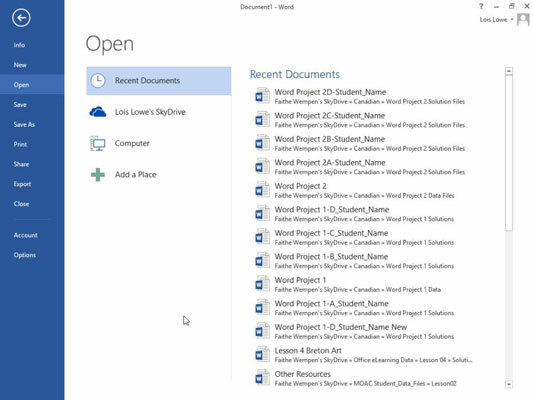 Buttons appear for creating a new document based on a variety of templates. Buttons appear for printing the active document. Buttons appear for saving and distributing the active document in different formats. Options appear for getting help with the application. The active document and Backstage view close. If prompted to save your changes, click Don’t Save. Word remains open. Close the Word Application by clicking the Close (X) button in the upper right corner of the window.